On May 10th feel invited to White Rabbit restaurant for a Chef For Change dinner. The change is at your door! 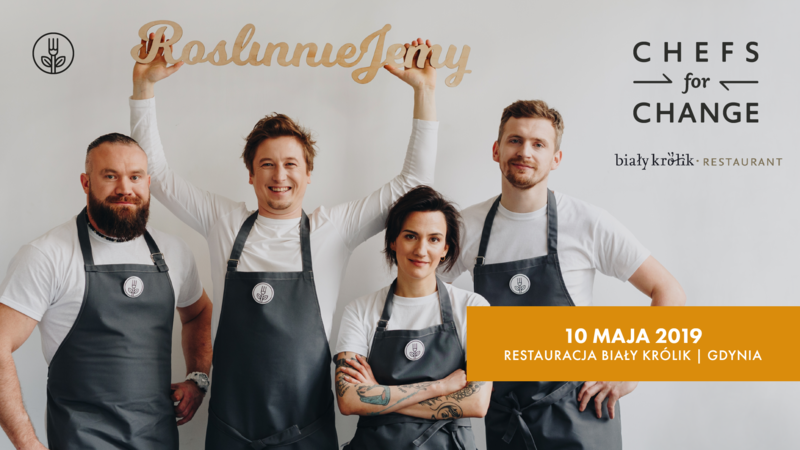 Chefs For Change is a series of plant-based charity dinners delivered by the top Polish chefs serving as ambassadors of RoślinnieJemy Campaign. We invite you to join us in White Rabbit restaurant in Gdynia to cherish delicious spring plant-based dishes prepared from seasonal & locally sourced ingredients. This is one and only chance to try out outstanding culinary skills of hosts: Marcin Popielarz and Rafał Koziorzemski as well as RoślinnieJemy Campaign ambassadors: Grzegorz Łapanowski Maria Przybyszewska, and Tomek Olewski. They will be supported by Jacek Koprowski from restaurant FINO. The plates will include, among others: vegetables from the “White Rabbit” garden accompanied by stonecrop guacamole, marinated white asparagus with cucumber and wild herbs sauce, sweet rice with young shoots of spruce, and 4 other tasting menu dishes. Delicious vegan wine will be served by Przemysław Andrzej Gwardzik from Pracownia Red Wine & Whisky and Lilu Fruits will provide the highest quality of fruits and vegetables. All the income generated during this event is set to support RoślinnieJemy Campaign, the part of Open Cages (Otwarte Klatki). Otwarte Klatki is Poland’s premier animal rights organisation which focuses on creating meaningful change for farmed animals and has been named as one of the 12 most effective pro-animal organizations in the world. In the response to the changing face of gastronomy, RoślinnieJemy encourages restaurants and food producers to introduce more plant-based products. The campaign also makes it as easy as possible for consumers to increase their consumption of plant-based food with supportive content.